The elation we feel about a loved one overcoming a life threatening illness. The encouragement we feel listening to the story of someone overcoming adversity. The optimism we feel reading about someone, who perhaps like you, started with nothing and built a multi-million dollar empire. Whatever the source of inspiration may be, inspirational stories give us vision and scope. They motivate us to seek out ways to better ourselves and the lives of those around us. It’s for these reasons that inspirational stories are such a great source for articles. First, take a trip down memory lane and brainstorm inspiring experiences, events, people, and even books that you’ve encountered in your life. It could be someone you know or maybe even a person/situation that you’ve read about. What Do Readers Ultimately Want? The ultimate benefit: To be self-sufficient and independent … to achieve freedom. Whether it’s to lose weight, gain financial success, DIY steps, or to ultimately find happiness, readers want to be free of obstacles that prevent them from achieving their dreams. You have all of the tools and experience to help them, but why should you give them the answers you fought so hard to get? Helping your reader helps you. Not only are you giving them the answer, you’re building a relationship forged on your authority. In turn, you will achieve your goals – even if those goals are to increase your credibility, exposure, traffic to your blog or website, or all of the above. 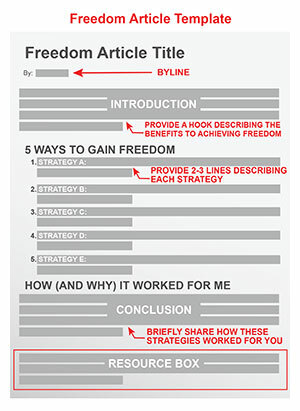 Help your readers and gain in your efforts by providing an informative, quality article using the Freedom Article Template. Humans generally aren’t classified as “lone wolves.” We like to connect, interact, share, and simply be together. Think of big events that happen – whether it’s something tragic, something political, something environmental, or even something joyful – we talk, we protest, we advocate … we do. Taking a look back reminds us of our shared history, experiences, and discoveries. Whether it’s nostalgic or the desire to do bigger, better things in our lives and business, it provides us with a foundation to look to our future. 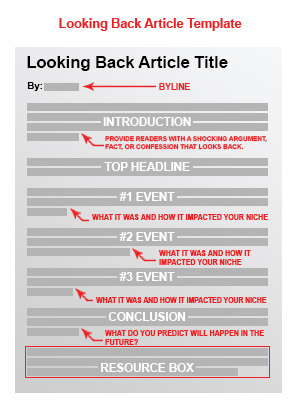 That’s why writing a Looking Back article is a great way to connect with your audience and increase engagement. Begin Building Your Article Portfolio Fast With These Templates! 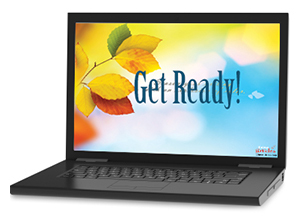 The holidays are coming up fast and for the online community, Cyber Monday is the kick-off. You can tap into Cyber Monday’s incredible traffic surge by writing engaging articles and submitting them before the big day. Seek Pleasure vs. Avoid Pain: Why Not Both? It’s widely known that people will do more to avoid pain than to gain pleasure. If someone is happy, they won’t necessarily look for ways to improve upon that happiness. However, if someone is in pain, they most certainly will want to find ways to be pain-free, including how to prevent or avoid pain. There are more articles that focus on what to do (overcome present pain), than what to avoid (completely bypass pain and continue on the road to pain-free happiness). One theory for this discrepancy is the difference of tone or attitude, i.e., positive tone vs. negative tone. Approaching a topic by stating “do this” or “don’t do this” resembles a parent scolding a child. Readers don’t like to be scolded. However, they do like informative tips that are engaging and give them the choice to find what best suits them and their situation. Which direction is it? What milestones must you achieve before you can get there? What’s holding you back? Once you’ve established what’s in between you (“A”) and your goal (“B”), you’re much more likely to find a way to get there. Goal setting is a powerful exercise because it gets us thinking about our ideal future and what we need to do to make that ideal future a reality. 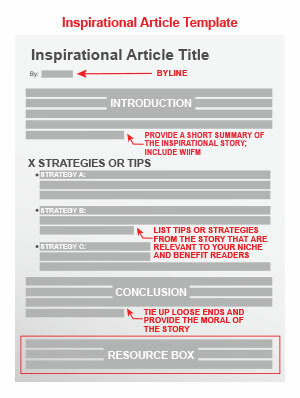 What’s so great about article templates? 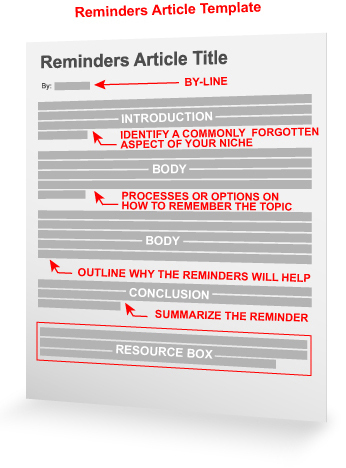 You can use templates to easily organize your thoughts and quickly write quality, original articles. Simply add content, rinse, and repeat for an endless source of quality articles stocked with your exclusive insights. 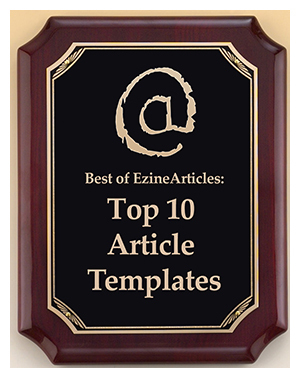 Refresh your article portfolio with the style, angle, and structure favored by readers and publishers: EzineArticles most outstanding article templates. 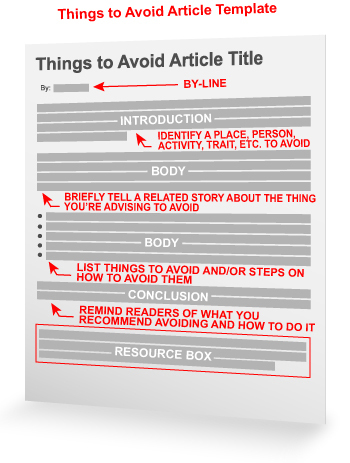 How-To Article Template – Readers crave DIY articles! Provide your audience with a thorough and original how-to guide based on your own experience. 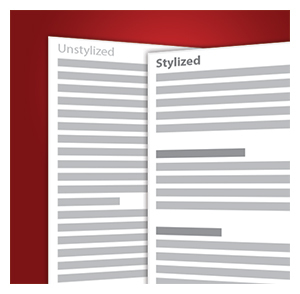 This incredibly flexible and powerful template is a must-have for all Expert Authors. Internet audiences are ravenous. When compared to printed publications, the majority of online readers consume content at alarming speeds. As an Expert Author, it’s important to deliver original, informative content in a succinct, stylized format that will compel readers forward. Try these writing tips and basic article templates so your readers can easily digest your quality articles. Be direct and engaging in your article’s introduction as well as be mindful of insatiable skimmers (e.g., Internet readers who consume articles at incredible speeds in their quest to find relevant content that benefits them). In your first sentence, provide a compelling analogy relevant to your article’s topic. In the last sentence of your introduction, provide your main idea and how it benefits the reader. What’s the one thing that sets you, as an Expert Author, apart from non-experts with a general interest in your niche? The human brain is a beautiful thing. As an expert faced with any kind of scenario in your niche, your brain has thousands or even tens of thousands of related memories from which to pull data and solve problems. Much of this data has been stored away in your long-term memory. Your long-term memory stores data via repetition, performing a task in a particular manner, sleep, etc. Given the amount of experience you have gathered in your niche, you may have picked up a few tricks to help you remember a procedure, an important matter, and much more. Someone with less experience doesn’t have that data, but they want it! You can share your own memory strengthening techniques in your niche through high-quality, original articles with the Reminders Article Template. One of the best ways to show your own mastery of a topic in your niche is by writing a discussion-based article on that topic. A discussion-based article stands out because it covers multiple angles of a topic or multiple perspectives, which are known as counterpoints. In other writing styles, counterpoints are only mentioned as a part of the conclusion and can appear unimportant. Articles that are discussion-based, on the other hand, thrive on the evolution of a back-and-forth conversation with more than one perspective. 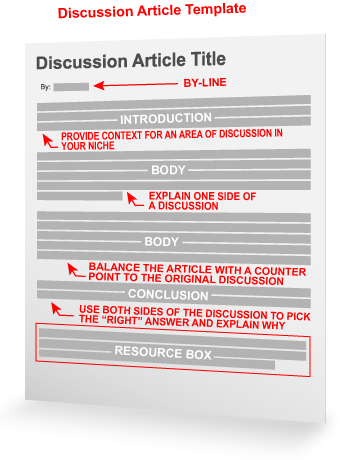 The Discussion Article Template is perfect for authors who understand all of the perspectives and can build a cohesive discussion. So what do you want to talk about today? 1. Introduction – Lay out the topic and context of the discussion. Include a brief summary of each side of the discussion to be explained further in the body of the article.